If you grew up during the 80s and you're a genre mutt like me, this comic book is going to press all your buttons. Set during the Reagan era, replete with Cold War paranoia splashed across the front page, Erin begins her new paper route the morning after Halloween. The foreboding is immediate with this book as it begins with Erin having a macabre nightmare that includes a member of the doomed Voyager space shuttle crew and a demon holding her little sister hostage in Hell. Jolted from sleep and assured her sister and everyone else is very much alive, she begins her day in the eery hours before dawn. 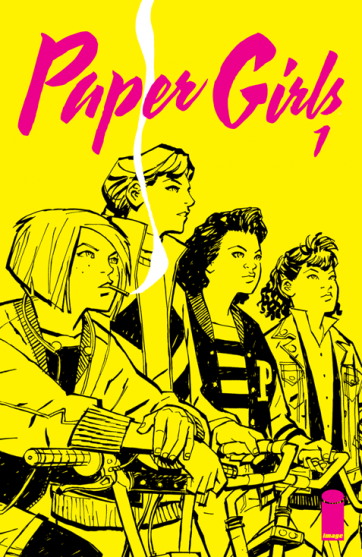 But things take a turn when she meets three other paper girls, Tiffany, KJ, and the ring leader and first paper girl in the town, Mac. Immediately I was struck by a Stand By Me vibe as this friendship was forged. A quartet of girls, with Erin in the Gordie LeChance role and Mac in the Teddy DuChamp role. The girls help Erin fend off a creepy trio of trick-or-treaters, they join forces to finish their routes. Erin winds up with Mac, kind of enamored by her alpha girl attitude and rulebreaker ways, as evidenced by a chance encounter with one of the local cops who knows her and her ne'er-do-well family. All that is just setting the stage, clearly marking out the traits of each girl. Erin the button-down responsible one, Mac the take-no-s**t tomboy, Tiffany the tech geek, and KJ the protective athlete. The development is pretty seamless and then thrown for a loop when the girls go on the hunt for another trio of masked hoodlums, only these baddies are tougher and stole one of Tiffany's walkie-talkies for some reason. And when the girls find out what the creeps have been up to, all bets are off. 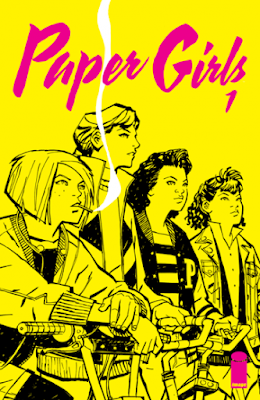 I gotta say that this was the best debut issue I've read in quite some time, and if you are into 80s-tinged YA action with a hint of scifi, then you will absolutely fall in love with this series. The artwork of Cliff Chiang is bold and yet warm enough to draw out the humanity of these characters almost from page one, and the coloring by Matt Wilson makes each page a beautiful interplay of blues and reds as the story plays out in the wee early hours of the morning. How the team follows this up with the second issue, I have no idea, but if they can keep this up through the whole series, it will be an absolute delight to follow along.